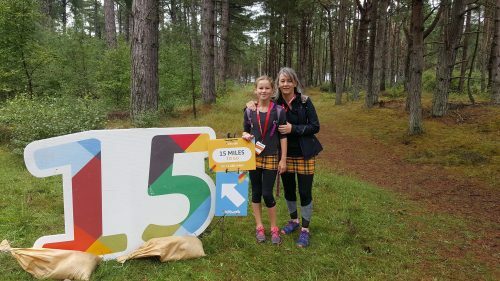 After weeks of glorious sunshine in Scotland, the morning of 19th August 2018 was cold, wet and windy – just the weather you need to embark on a 26 mile sponsored walk…NOT. 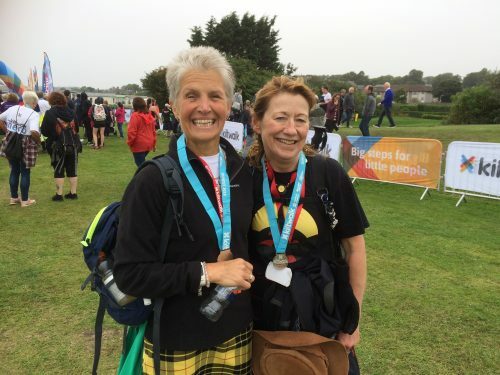 This didn’t deter the bunch of 12 hardy Scots lasses and two hardy Scots lads/gentlemen who had agreed to walk from St Andrews to Monifieth as part of the Dundee Kiltwalk to raise money for The Uphill Trust. Named Team Uphillya by Caroline, we were just a fraction of the nearly 3000 walkers who took part on the day. 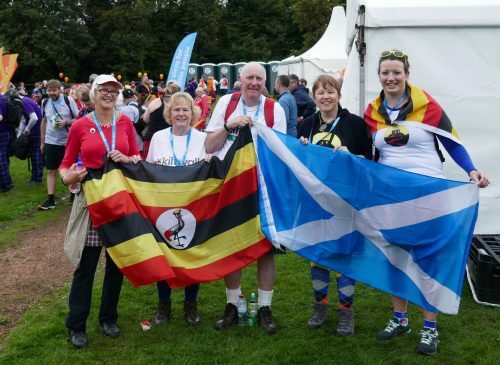 Our 7 Mighty Stride walkers were tackling the whole Kiltwalk marathon distance, 26 miles. Their starting place was St Andrews Old Course at 9am. Most of the walkers were dressed in yellow plastic ponchos which the wind kept whipping up over their heads. Their warm-up routine was essential to stop them freezing. I wouldn’t hear from the intrepid 7 for about 5 hours. As team organiser, myself, along with Morag, Colin, Caroline and Kathryn had signed up for the middle distance walk of 11 miles starting in Tayport and ending in Monifieth –The Big Stride. We met up at our start in Tayport for 11am when the weather was still not great. More yellow ponchos and yellow sunglasses were given out by the organisers to cover all eventualities. 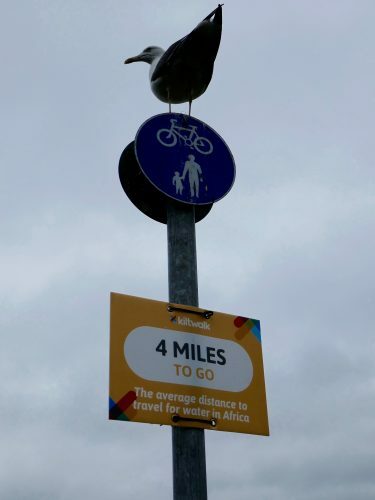 After a warm-up session by a great MC and inspirational messages from Sir Tom Hunter (the brains and the money behind these Kiltwalks), we set off at a nice gentle pace. Kathryn’s long youthful legs and roller derby training meant she was taking one stride to every three of mine but we stayed together as a bunch chatting all the way. Morag as a retired teacher and Kathryn as a current teacher discovered they had lots in common. Colin as a retired pharmacist and me as a dentist put the world to rights about the NHS. Caroline and I swapped choir stories. The miles were disappearing, the weather was improving, it had stopped raining, the first pit stop was approaching at the Tay Bridge and the view was fabulous across the Tay. After a brief stop while crisps, water and Tunnocks wafers were scoffed, we had a quick photo call with the Ugandan flag and then set off across the Tay Bridge. All the way across cars were hooting and folk waving which was a great encouragement. At the Dundee end of the bridge the very thoughtful organisers had installed yet another big line of portable loos so after a short comfort break, it was off again. 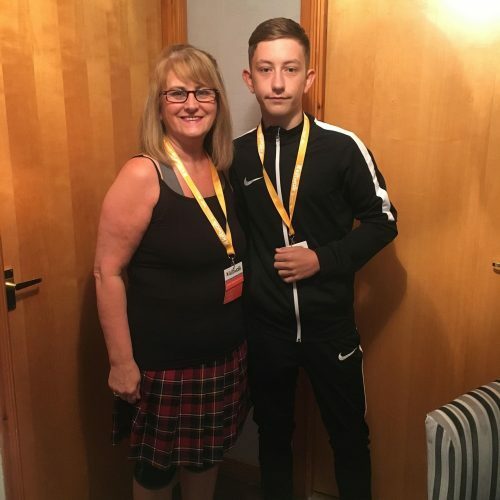 At 1pm, while we had been walking our first few miles, the last two members of our team, Gail and her grandson Ewan, were beginning their walk below the Tay Bridge. The Wee Wander of 6 miles had a great turnout, including some folk in wheelchairs and many others who were accompanied by their pet dogs. Gail says that she thought the organisation was brilliant and was so pleased to see all the portable loos along the route. Ewan was apparently trying to get Gran to walk faster as he was off and heading for the finish at speed. These two were away and had completed their 6 miles well before the rest of us got anywhere near to the finishing post. When I messaged Gail to ask how they were doing the reply was, “We are all done, and home with our feet up enjoying a cuppa.” Nice one. Meanwhile the 5 Big Strollers were eating up the miles along the north bank of the Tay, and looking back across to where we had been a couple of hours previously. After two more very well organised pit stops and encouragement along the way from lots of lovely volunteer stewards –“The Kilties“– we were closing in on the finish. Morag, inspired by the pipe band playing Highland Cathedral at Broughty Castle, even had the energy to perform a very brief Highland Fling before we headed off for the last few miles. Despite some blisters and sore toes the end was very close. Finally, in just over 4 hours, we had done it. The tented village at the finish, the great crowd of walkers all wearing their medals of honour, the music, FOOD and a very welcome sit down was wonderful. Coffee in one hand, a glass of red wine in the other and a medal round your neck…fabulous. The Big Stride guys were still walking at this stage and I hung about at the finish hoping to shout them all in over the line. I didn’t have to wait too long. Gillian and Katie were the first, followed very shortly by Alison and Debbie, all with big smiles. They had made the 26 miles in around 7 and half hours. 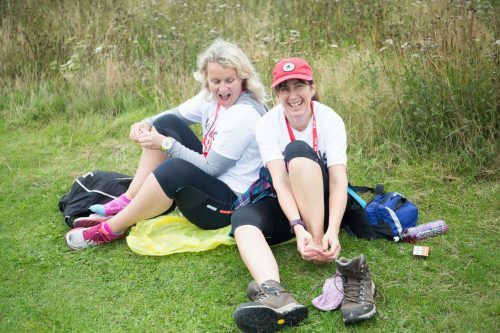 Alison said it was the fastest 26 miles she had ever walked and Debbie didn’t even look like she had broken sweat. The weather which had brightened up during most of the day was now closing in again and a wet sea mist was rolling in. Much too cold to hang about so home and a long soak in the bath was in order. Sarah and her friends, closely followed by Kirsteen and Becky, made it to the finish at between 8 and 9 hours. A great sense of achievement and a great day for us all. The blisters, sore toes and muscle aches were insignificant. The encouragement we all had from our friends, families, and all the donors who sponsored us made the day special. 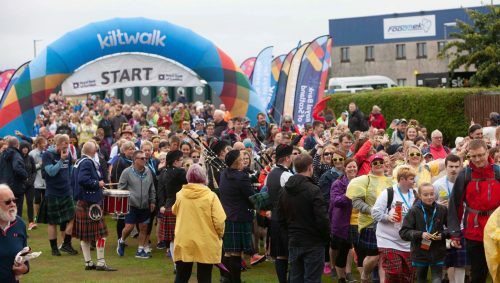 Knowing that all the sponsor money would be topped up by another 40% by the Kiltwalk organisers had certainly lightened our feet as we walked. The final figure raised was a whopping £6,190.70! Wow! This means a new classroom for the kids at Uphill Junior School. What a fabulous team of walkers and an equally fabulous result. A HUGE HUGE THANK YOU TO team Uphillya— Alison, Debbie, Kathryn, Kirsteen, Sarah, Caroline, Gillian, Katie, Becky, Morag, Colin, Gail and Ewan. 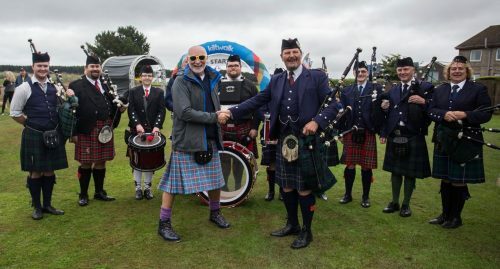 Sir Tom Hunter, his charity The Tom Hunter Foundation, the Kiltwalk organisers, their teams, and the volunteer Kilties made it a great experience and one which any person of any ability can take part in. Will I do it again? YES and I will even go for the 26 miles next year (with, of course, the risk of exhausting my wonderful supporters, sorry, guys!). 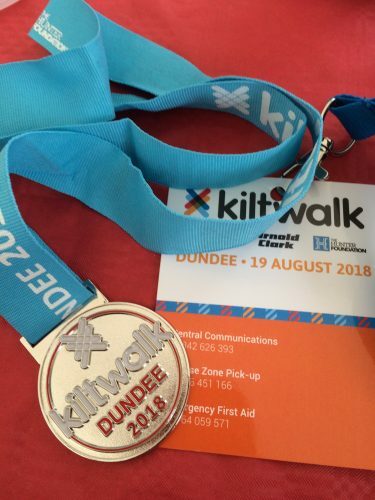 Who will join me on August 18th 2019 for the next Dundee Kiltwalk?